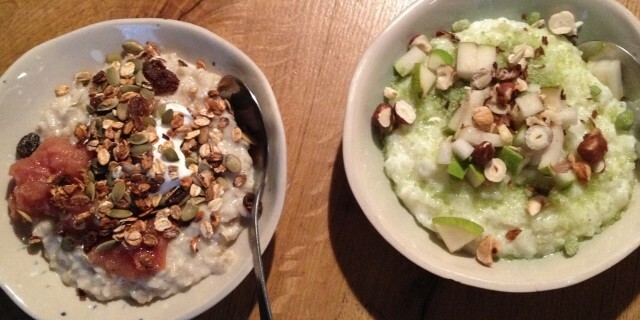 On my visit to Copenhagen last year I fell in love with the porridge bar, Grød. Grød is Danish for porridge. If you ever get bored with your daily bowl of oatmeal, Grød is the place to go. Grød’s mission is to redefine porridge and basically to get everyone to enjoy porridge. If you grew up eating bland porridge as a kid you might not get very excited about the prospect of eating porridge again, but I am convinced you’ll change your mind after trying Grød‘s porridge mixes. They are creative and so tasty. Last time I was in Copenhagen I packed a whole suitcase with porridge mixes and toppings like freeze-dried buckthorn and raspberries. The best part about Grød is that they have recently started selling their porridge mixes in The Netherlands. You can find our more here. This is great news but I can’t wait until they open a proper store where you can sit down and enjoy a bowl of porridge and buy your favorite porridge mixes and toppings to take back home. I have porridge almost daily in winter but I really love to spice things up. If you like to get creative in your own kitchen, try a few of my favourite porridge recipes here and here.